Ironman 70.3 Exmoor – the Epic Wimbleball! Please Sponsor me for IM70.3 Exmoor& IM Wales- part of the Rotary Fundraiser team raising money for great causes all over the world! Reap my revenge on Wimbleball – it killed me last time, I had to finish feeling that I was the victor this year! In the months leading up to Wimbleball I had several niggles, my knee problem had got much better since February but then it went on me again about 5 weeks ago so I hadn’t done much running and I had that in the back of the mind. I also had a toenail fall off 1 week before the race so again I wasn’t sure if that would bother me, however, in the week leading up to the race I was feeling really good, my knee felt stronger and I was very surprised that in the space of only a few days my toe healed so well I couldn’t even feel that I had lost a nail. Race morning I woke up, and for the first time in a long time, I didn’t have that feeling “why do I do this?” as the alarm went off at 3am. I actually sprung out of bed raring to go and really excited for the race, even though it was forecast for heavy rain all day. We got to Wimbleball lake and did the usual pre-race bike checks and before I knew it, it was 6:30am and I was standing in line in my wetsuit in the rain waiting for the official march down to the lake. My swim went well – I felt relaxed the whole way through, got a bit battered at the first turn buoy but continued with a nice easy rhythm. The time wasn’t anything amazing and far from a PB for the distance but it was an improvement of 7 minutes over my 2013 time. Happy with the swim, I ran up the hill to transition (it’s a long run) and spent some time wrapping up as it was by now raining very heavily so opted so a waterproof, arm warmers and a jersey. Heading out on the bike was chaos, it is very narrow single track roads around Wimbleball lake so that paired the large puddles and usual mount line chaos meant it was a slow start but I was soon peddling away on the route and I took my time, having ridden this course once before in a race and twice on a training weekend with my friend Claire (all 3 times in the rain might I add) I knew what was to come so I was in no hurry to power off up that first hill. The first lap was pretty much constant heavy rain, my boyfriend Mark had waited for me to get out of the swim then headed out onto his own training session riding part of the course in reverse so it was nice to see him when I was around 2/3 way around the first lap. On the second lap I felt great, I was still smiling and thanking all the marshals and generally having a lovely day out in the countryside in the best of British summer weather. I think having had quite a few training rides in the rain this year had toughened me up to the elements, knowing nothing would ever be as bad as hitting the top of the Le Col der Fer in an electric storm and having a treacherous 30km descent in torrential rain with my training squad buddies only a month before this seemed to make the rain almost non existent. I was a little annoyed at one point that my chain dropped off the chain ring just before hitting a hill so I had to dismount to sort that but other than that a fairly uneventful bike leg. Once I hit the end of the second lap and knew It was a fairly flat 7 or 8km to home so I put the power down a little bit and passed loads of people in that last stretch all of who looked like they had overcooked the hills and were suffering. Into T2 looked at my watch and knew I hadn’t pushed it hard enough as my time was pretty similar to the last time I raced, albeit I raced on a triple chainset last time and now ride a 56,39 chain set with a 26 cassette so not the ideal hill set up I have to admit! Still, I was a minute faster, and improvement is improvement and means my coach and I know now we can push my HR levels much higher in coming races. This year, I seemed to have learnt to push harder on runs than I have been able to previously. Not sure how much of that is learning to suffer and how much is due to the fact that since being diagnosed with autoimmune disease and going gluten free I now don’t have any gastric distress. That said, my plan as always was come out of T2 (03:51) at a slow jog to allow my HR drop and take on some fluid and fuel (a bottle of RaceRx), however the pacing part of the plan didn’t seem to work, I went slow but my HR would not drop to the level it was meant to. At this point I felt really good, my legs were killing me but I knew that feeling would pass, mentally I felt good and physically I knew I had a strong run in me. I made the bold choice to ignore my HR plan, this was a tough call as in Majorca I ran to plan exactly and had an amazing run….however, something felt different and I made the decision to use the plan but instead of HR levels used perceived exertion. I am pleased to say I nailed it – lap one was steady, lap 2 I surged a bit and powered away feeling amazing, lap 3 I had a slight lull early on but spent the majority of it feeling great again and it was my fastest lap. Stupidly I thought a half distance was a 20km run so at 18km put my final gear into action and then at 19.5km saw a sign saying 1 mile to go – I wasn’t sure if I could hold the pace for another full mile but I did, and ended up crossing the finish line with a huge smile on my face knowing I had, had an amazing race ad taken a good 12 minutes of my previous run time and achieved my 3 objectives for the race. So was it the race of my life?? No, I didn’t push hard enough on the swim or the bike but I am 100% happy with the outcome and really pleased with the progress I am making. This race was up there with Majorca 70.3 in terms of how I felt I performed, now I need to work on pushing harder on the bike to improve my times but not to the detriment of my run. Hopefully this has set me up well for IM Wales in 10weeks from now, it has done my confidence a lot of good and I am genuinely excited to see what happens in Wales. Thanks as always goes out to our squad sponsors; Triathlon Zone of St Albans, MPG, Bowller and HKR Architects. It was with a bit of a sigh that I set my alarm clock on Saturday evening. A wake up call starting with a 4 is never my best start to a day. My third weekend of racing in a row after an exceptionally busy work week which saw me missing the majority of my planned training sessions – poor planning on my part – but I was looking forward to another sprint race. Being as I had just done a middle distance race the weekend before I told myself not to think about this weekend as a competitive race but to have a fun race with my squad mates. We had a team of 6 racing at the event – Cameron, Gerry, Dan, Myself, Lucy and Pippa. 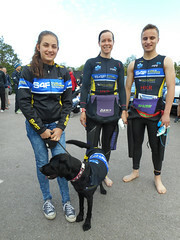 In addition to the athletes we had quite a big support squad with wives, children, non-racing squad members, squad sponsors, and 2 canine cheerleaders! The swim was a 1 lap 750m swim in Stanborough Lake – my local lake being only 4 miles from home, but I’ve never been there before the race as they don’t hold regular swim sessions anymore. It was cold but I managed a couple of minutes warm up whilst waiting for the start. I seemed to get off on the gun quite quickly from the front row but was quickly swamped and in the middle of a crazy mix of arms, legs and fists again. Luckily I don’t mind getting into the thick of it and until my swimming improves its something I have to stick with, as I like starting at the front. I got out of the swim in decent time and a quick glance behind me made me realize I was quite near the front (13:51). Onto the bike – and because of the gravel path run out to the mount line and the incident I had with shoes on the bike last weekend I decided to do an old fashioned mount, putting bike my shoes on in transition and just running with my bike in my shoes (51s). The mount area was a bit of a mess, the mount line was at the bottom of a 5m hill with a 90degree left hand turn at the top of the if so the marshals’ were all shouting to make people push bikes to the top then mount, this then meant there was around 10 people trying to mount a bike, on a single bike width section of road – it was chaos! Anyway, away we went and all went smoothly for a round 2mins before I heard a very worrying sound on my bike – I couldn’t work out was it was but it was very clanky and felt like my rear brake was binding again….. As it was a 20km ride only I decided to ignore it. Part way in to the bike Gerry went cruising on by at a point where I was sitting upright trying to work out what was about to fall off my bike, he did say afterwards it was making quite a noise! About ¾ way around the bike the noises all seem to stop and the bike seemed to have settle in so I smashed the last 5km or so overtaking quite a few woman. After finishing the race I realised what the noise has been, one of my brake blocks had been loose and then had fallen of meaning I wasn’t braking pad on disc, I was braking brake fixing on tyre – needless to say my tyre is now ruined. I was pleased that on the bike course I was only over taken for about 4 or 5 people – all of them men! There is a short out and back turnaround at the end of the bike course and so I saw Cameron and Gerry on this so I gave them both a shout of encouragement (42:51). Into T2 and I quickly dumped my bike, got my shoes on and off I went on the run (35s). The run is a 2.5km lap, which you do 2 laps of, mostly on grass and mainly flat with the exception of one big hill at the end of each lap. I felt like I was going strong on the first lap and passed lots of people but then it was hard to tell if the people were from the sprint race or the Olympic distance athletes that had set off earlier, on the second lap I kept going strong and finished with a hard sprint – it hurt but it wasn’t anything near as tough as the St. Neots sprint where I literally was doubled up in pain afterwards. Run time was 21:48 – not a PB but happy with that considering it was my third race in 3 weeks, last weeks being a hilly middle distance. Overall time was1:19:58 and I was 5th female and 1st in my AG. The results sheets however didn’t tell you your position so I was really surprised when they called my name out as AG winner to pick up a medal and even more surprised when they then called my name out as Hertfordshire 35-39 Champion, and I got a lovely trophy for that. Overall a great race but I am glad that I’m not racing for a couple weekends now – lie in’s beckon! 2 weekends ago was my first race of the 2014 season and also for my first race as part of team Raceforce. The weekend before the race, my bike and bike kit was collected by Kate and Grant. I had arranged for collection to be from my friend Claire’s house as we had booked the service together and agreed to have one collection point. The bikes are mounted into a rack system in the van by the front forks meaning the only thing that needs doing to the bike is removal of the front wheel. As I had experienced some issues with the brakes and wheels compatibility which I wasn’t entirely certain had been resolved by my local bike shop, I was also taking a spare pair of wheels with me, which Kate kindly allowed as extra luggage without charging me. At the collection point I had a chat with Grant (the mechanic) and he agreed to look over the brakes / wheels as I was not happy with the setup since it has come back from its ‘service’ at the shop the day before. The gears also needed re-indexing as again my local bike shop didn’t seem to have done this properly even though it was one of the things I had booked it in for (I won’t be using them again it has to be said!). So a full week before the race I had handed my bike and bike kit over and it was one less thing to worry about in the days before flying out to Majorca. This was a huge weight of my mind after the stress I had breaking down the rather complex front end of my TT bike for a flight to Lanza a couple months previously. On the Tuesday before my race I got a text message from Grant telling me my bike was all sorted and the gears had been re-indexed and it was at their Villa in Alcudia ready and waiting. This put my mind at rest and meant I could concentrate on race prep, packing and the final weeks training. I was very lucky to have two close friends racing this with me. Claire (also a member of Team Race force) and Anna are two of a group of close friends I have made from my local Triathlon club. We decided to make this race a bit of a girls holiday too as we were setting of on Thursday with return flights on the Monday. Unfortunately due to Claire’s son having an accident shortly before the holiday, she didn’t fly out with us as originally planed and had to join us on the Friday instead. Luckily though her little boy is well on the mend and she was still able to join us, her family had agreed she couldn’t miss out on this race so convinced her it was the right thing to come out and meet us, just a day later than originally planned. When myself and Anna landed in Majorca, we were met by Louise and Kate’s dad, who were collecting Anna’s bike as part of the airport collect Raceforce service. They kindly gave us both a lift to the hotel before taking Anna’s bike back to base to be built. Once myself and Anna had unpacked and had a quick reccie of the area we went to register for the race and then made our way over to the Raceforce stand on the expo. My bike was already for collection and Anna’s bike was just being finished off. We took all the bikes (including Claire’s) back to the hotel and then went back to meet Kate for a gentle little ride to test our bikes and have a little explore. Needless to say, the lead up to race day went past in a blur…… race day itself was amazing and I have a separate blog on that. After the race, I went home to shower and eat then had a walk (more of a hobble) over the the expo with my bike and luggage to drop off with Kate and the Race force team. Thats was it – no more worries about bikes – we were free to party and celebrate, and party we did!! The day after our flight home, the bikes were delivered back to us. The whole shipping concept to me is so much easier than worrying about the time / effort / and technical worries of dismantling, packing and re-building a bike when you only have a few days total in the country your racing in. I am using the ams service again for IM Austria next month and cant wait to get back out there racing (and socialising) with Team Raceforce!! Thanks to Kate and Grant and the rest of the Raceforce team. Chilli Dog my new Mascot…. So here we go! My first race report of the 2014 season. A race I have been really looking forward to but at the same time, a little surprised about how quickly it seemed to sneak up on me. It seems only weeks ago that I was winter training and races seemed to be months away but you know if it, your packing and heading of the the airport! Packed and Ready to go! I was very lucky to have two close friends racing this with me. Claire and Anna are two of a group of close friends I have made from my local Triathlon club. We decided to make this race a bit of a girls holiday too as we were setting of on Thursday with return flights on the Monday. Unfortunately due to Claire’s son breaking his arm and needed an op, she didn’t make it out with us as originally planed and had to join us on the Friday instead. Luckily though her little boy is well on the mend and she was still able to join us, just a day alter than originally planned. To practice my new nutrition strategy – following last years issues I have changed my pre race diet for the week leading up to the race to be wheat free and also changed my race nutrition to be wheat free and more natural. One key area of this has been using Advanced Tri Fuel for pre race drink, bike fluids and start of run leg fuel. Secondary aim – I needed to feel like I paced my race correctly without blowing up and slowing down at any stage. My coach’s ideal for pacing is to see a very slightly increasing HR over the bike and run legs so that i’m pretty much cycling and running to achieve negative splits. 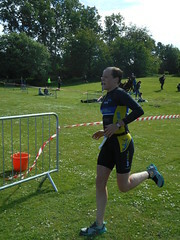 Third aim – to achieve a personal best after i was literally destroyed by first Half IM last year at Wimbleball. New Race kit ready for its Debut! Generally speaking – I loved this race! The sea swim was fab. As my coach had advised, I decided to start very near the front, it’s a narrow start funnel only about 15 people wide so I was about 2nd row. I did get bashed about a bit and an elbow to one goggle eye but it didn’t displace them and I swam on through. I was very pleased with my sighting but couldn’t draft as much as I wanted to as some of the feet I tried to get on were drifting off course so I obviously didn’t want to be pulled in the wrong direction. I stayed very close to the buoys so maybe I needed to be a little further from them in order to catch onto some faster feet!! Swim split – 32:15Over the moon with this! 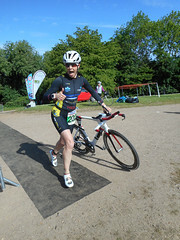 T1 – 05:31.I missed my bike rack (school girl error) so lost time running on and down the crazily long transition area! The bike leg was amazing, having spent a week cycling in Majorca this time last year I knew the kind of terrain to expect and was really looking forward to it. This race is the first time I’ve used my race bike properly and my god it felt fast! The bike course is amazing, a massive hill that lasts about 15km and some undulations but lots of long flat sections where I felt I was really tanking it along. There is an amazing long hair pin descent which I loved even though I’m rubbish at technical descents and lost a lot of time in that section. I also lost time trying to drink on the flats as i could reach my bottles whilst on climbs or fast descents so I think some form of speedfil bottle will be a valuable addition to my bike set up in time for my next IM. I finished the bike split feeling good and well fuelled after taking 3 full bottles of ATF, along with some non wheat based solid fuel. Bike split – 03:03:00 Again, very happy with this split. T2 – 02:35. I still haven’t learnt the trick of having shoes clipped into pedals and leaving them clipped in after dismount so this slowed me a little too but I’ll be working on this for my next race. The run was also great. I started the race with a steady start which allowed me to get another bottle of ATF down me before I picked up the pace. The long out and back was a little boring at times but I had a plan and stuck to it which meant I knew I could ramp up the pace on the second and third and laps. At a point on the third lap when I was questioning if I could keep the pace up until the end, my friend Claire saw me and could see the pain I was in, she simply shouted ‘dig deep Allie’ and I knew I had to if I wanted to stay ahead of some people I had just passed on lap 2! I managed a good negative split with a very strong final 3miles so I was really pleased with how i pushed myself and keep the pace increasing up until i crossed the finish line. Overall, I’m over the moon, I didn’t have a time in mind for this race but simply wanted to feel like I had pushed hard and bettered my Wimbleball race of last year. This race gave me a PB of nearly and hour and a half so I can’t complain about that. I know Wimbleball is a slower course but I’m set to return there next to settle some unfinished business after it destroyed me last year!! Thanks to my friends mitten and Claire for being fab holiday / race buddies. It’s lovely to make more than just a race of a trip to somewhere as nice as Majorca.